Samuel Hahnemann a German physician first developed the herbal medicine called homeopathy in early 1800. This approach of herbal medicine provides, holistic and natural healing to a person. In the recent times, homeopathy has gained a lot of popularity in the recent times and homeopathy clinic in Vadodara is what are people are looking forward to. Cosmo Homeo Healing Center which is more popularly known as CHHC is one of the well-known homeopathy clinics that is serving to provide aid so many people for years as of now. With about 25 years of proficiency and expertise, CHHC has become a much-celebrated platform in the homeopathic healing. 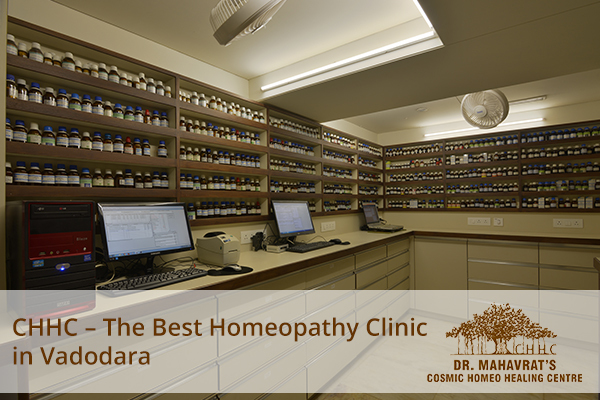 If you are looking forward to any homeopathy clinic in Vadodara, then CHHC would be certainly the ideal choice in the regard. CHHC provides a number of solid benefits to then patients and hence is one of the most preferred homeopathic clinics in Vadodara. Some of the top benefits offered by the clinic are as enumerated below. Homeopathy medicine is entirely made of herbal ingredients. Thus, it can always heal the diseases with their symptoms without affecting the patient’s health. The CHHC clinic aims to detect the main cause of occurrence of the problem which allopathy does not do. Our clinic always tries to provide a permanent solution instead of providing a temporary healing. Homeopathic medicines are perfectly suitable for the children as well as the infants. We at CHHC focus on providing safe medication to your kid so there are never ever any complications or any kinds of any sort. Our homeopathic medicine does not have any reaction with any other medicines that you are already taking. This is one of the greatest benefits why the people prefer to visit our clinic. It is completely safe to have the homeopathy medicines while you’re taking some other medications at the same time. Another of the top benefit of taking homeopathic medicines form our clinic is that they do not have any kinds of known or visible side effects. Being devoid of any kinds of any severe side effects, the people can take the medicines without any kinds of troubles or worries. Thus, if you’re suffering from any disease for a long time which allopathy could not cure it, try the Cosmo Homeo Healing Center to get the desired results.